One solution for all minor cuts and scrapes. Seals out water, dirt and Bacteria. Very skin friendly. Stays on more than 2 days. 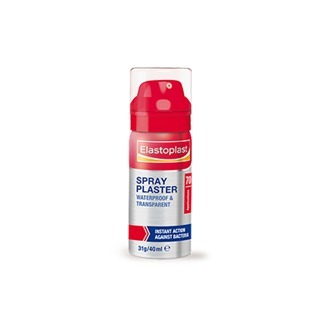 Elastoplast Spray Bandage works on all different body parts, so you always have the proper bandage. The transparent, breathable film seals the area from water, dirt and bacteria for maximum protection. The skin-friendly bandage covers the would like a second skin and allows natural healing.